EV Grieve: Are you ready for some Monday Night ... Steakhouse at Casimir? Are you ready for some Monday Night ... Steakhouse at Casimir? Who wouldn’t want to treat themselves to a decadent steakhouse dinner? However, steakhouse prices have put this luxury out of reach for more and more diners. But not anymore! East Village French bistro Casimir has introduced Monday Night Steakhouse – a weekly special featuring every steak on its menu for only $9.95! Starting Monday, July 25, 2011 Monday Night Steakhouse is set to tempt your taste buds without sacrificing your budget. Indulge in 12 ounces of favorites such as ribeye and skirt steak, filet mignon, steak tartare, the juicy Casimir hamburger and even a grilled pork chop – all for the wallet-friendly price of $9.95. This new and exciting special is the brainchild of new management that is poised to reinvigorate the restaurant, an early pioneer of the East Village dining renaissance. Mario Carta formerly of Chazal and Lea Midtown has amassed over a decade of expertise managing and developing restaurant concepts which he plans to utilize in this his latest endeavor. Monday Night Steakhouse is one of many new initiatives that Carta plans to roll out during the upcoming months. Although the management may be new, Carta plans to retain the inviting atmosphere, attentive service and uncomplicated cuisine that has made Casimir popular among destination diners and neighborhood locals. Monday Night Steakhouse is available on Mondays from 5:30 pm to 12 am. Casimir is located at 103 Ave. B, between 6th & 7th Streets. 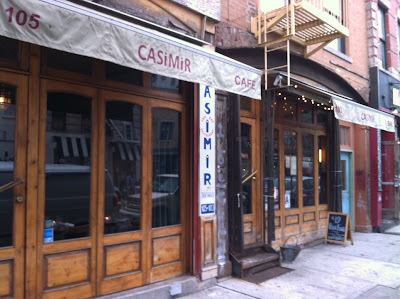 Changes in store for Casimir on Avenue B?